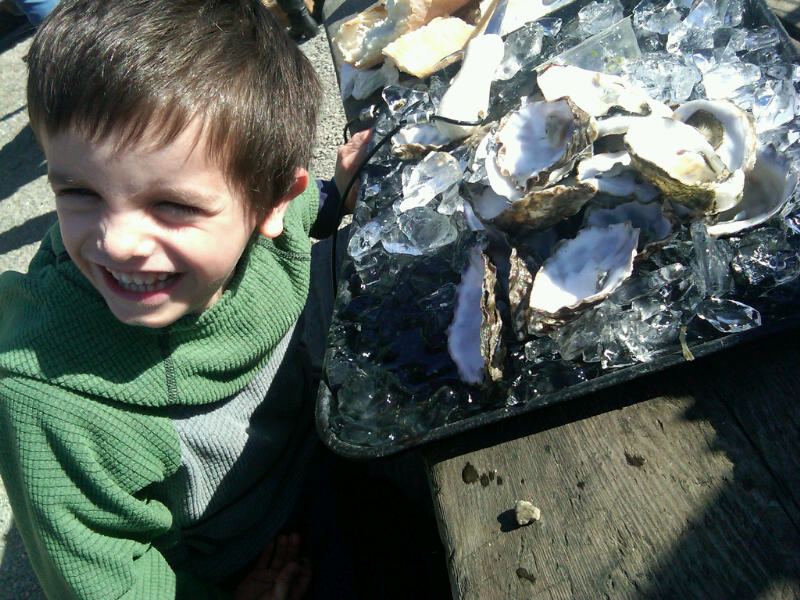 Last week Sage and I loaded up for a day on the coast – tidepooling, whale watching, and an exploratory visit to Tomales Bay and the Hog Island Oyster Farm. Sage is 5 and generally adores fresh fish and seafood of all kinds – grilled Baja dorado, my cider-cured and applewood smoked trout, and Bodega Bay crab are all favorites. He also eats ikura, shrimp and tako nigiri like a champ. But I wasn’t sure how oysters would go over, and I knew it would be risky to drive all the way from Bodega Bay (the whales) to Marshall (the oyster farm). But lately I have been fixating on local seafood myself, and I discovered that the Hog Island Oyster Farm was not only visitor friendly but also produces what might be the finest oysters in the Bay Area. So I took my chances and we made the drive. This entry was posted in GeoKitchen Posts and tagged Local Foods on February 8, 2011 by garyfleener.